Schedule Visits for Your Entire Family Today! 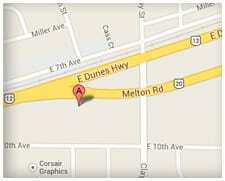 Healthy Smiles is conveniently located on Melton Road and Route 20, and serves patients in neighborhoods throughout Northwest Indiana, including Gary, Miller, and Miller Beach. Our brand new office is spotless, comfortable, and well-equipped, and our entire team is inviting, friendly, and helpful. We offer a complete menu of preventive, restorative, and cosmetic services to meet the needs of your entire family. We look forward to forging a long and happy relationship with you!